I've been tinkering around with the blog this week and have added some new features! You may have noticed that the header is a little different. Do you like its new look? 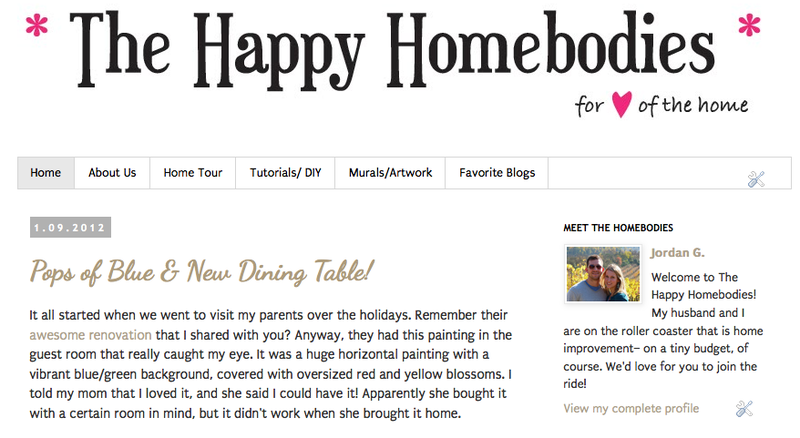 Just below the header is a new menu bar featuring some new pages that I added to the blog: About Us, Home Tour, Tutorials/DIY, Murals/Artwork and Favorite Blogs. 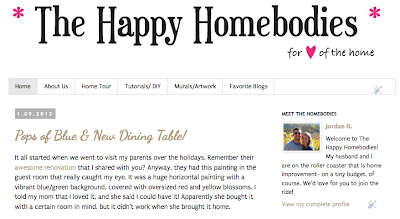 Hopefully this new feature will be helpful when you navigate the blog! I'll be adding to those pages as we renovate new parts of the house or add more tutorials and artwork. At the end of each post, there are labels that list the main subjects of each post. You can click on those subjects to read whatever other posts I have about those topics. For example, if you clicked on "dining room" below, you would be directed a page with all of the posts that also talk about the dining room. Make sense? I'm still going through my archives to label all of my old posts, but I hope to have that completed asap. Let me know if you like the changes and if you have any other ideas for ways I can improve the functionality of the blog! I'm still pretty new at this blog stuff, but I'm learning.